The excitement of Summer vacation is upon us! If your schools haven't let out for the summer yet, they will very soon, and that means your kids will need things to do. 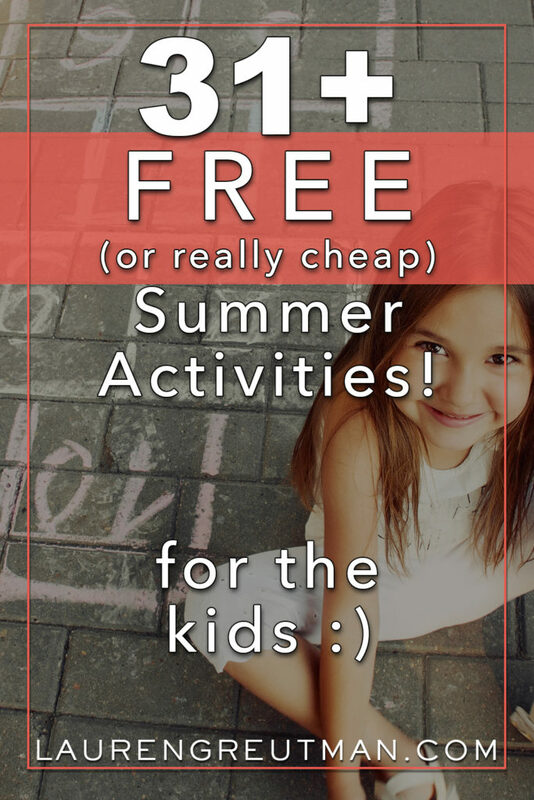 Finding cheap, free, and easy Summer activities for your kids can make all the difference in your sanity, and their enjoyment. I probably have a pretty selective memory from when I was a kid. Telling my kids my perception of how I lived every day as a kid (whether it's accurate or not) isn't going to change the present reality. Things are different now than they used to be. They probably just need a helpful nudge in the right direction, and they'll be off to the races. I've got just the “helpful nudges” you need to help you Enjoy the Summer for FREE (or really cheap). Depending on the age of your kids, some of these ideas will be very “parent-facilitated”. That might excite some of you, and might be a huge turn-off to others. Let's get real. I have mom friends that are big ‘doers' with their kids and they will do all of these, PLUS get their kids to hike up a different mountain every weekend. I love them! And other mom friends that are more, “Can't I just sit here and read while they entertain themselves?” I love them too! So, pick what works for your specific brand of momming. I'm coming out of the gate strong with this one. Reading ability loss over Summer break is real. Studies show that students who aren't actively reading over the summer can see a stagnation or loss of learning. No Bueno. Try to have your children reading most days over the summer. Even reading to them helps too! Set short-term and Long-term Summer reading rewards. If your child hates reading, let watching a set amount of TV be the reward for reading each day. Then set a large reward if they finish a book or books. For instance, if you typically go to an amusement park sometime over the summer. Just make that the reward for them reaching their reading goal. There are also tons of Summer reading programs that can help incentivize Summer reading as well. If your kids are old enough to ride, go on a family bike ride. And if you do it many times during the week, it'll kill a lot of time, and you'll get a little exercise too! Use paint, markers, puffy paint, watercolors, food coloring, really anything you have. Let them make a mess and have fun decorating T-shirts you wouldn't mind getting rid of. See what they come up with. This is an awesome way to declutter the house, make some extra money, keep the kids busy, and get them to make a little money too! With your guidance, let your kids sell some of their own stuff they don't want anymore. Or if they make crafts, let them sell those. 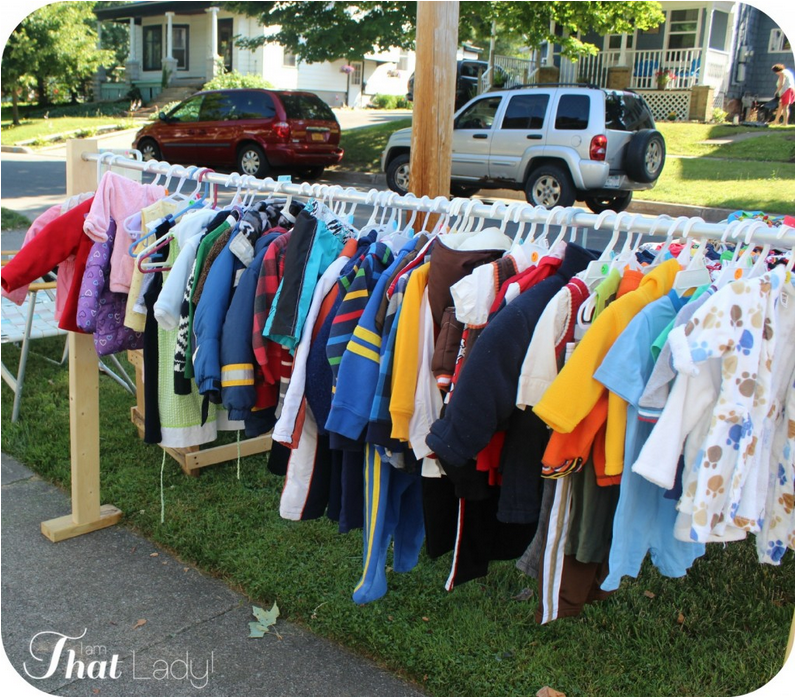 You can teach them a lot just from a garage sale – advertising, budgeting, how to price items, organizing, etc. One of the last times we did a garage sale, my son made $59! He was so proud of himself, and ya know what? He should be! Here's a guide with great tips on how to set up, organize, and price items at a garage sale. 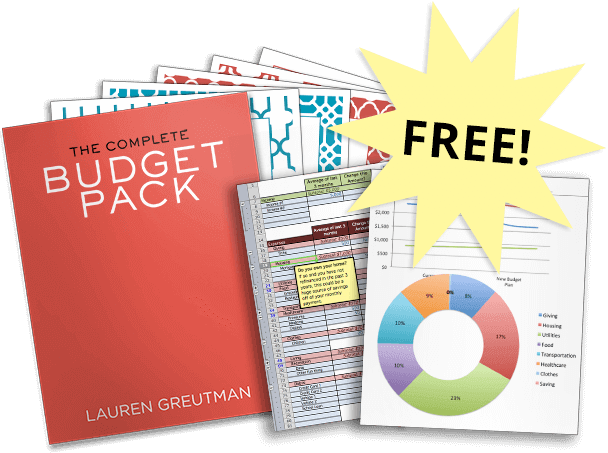 There's even a downloadable sheet included to help! And for some real motivation, what about telling the kids that the garage sale money is going towards the trip to the amusement park. That'll get them moving! Making ‘Slime' at home Is a really fun craft and the supplies for it are really cheap! You might even have them all already. 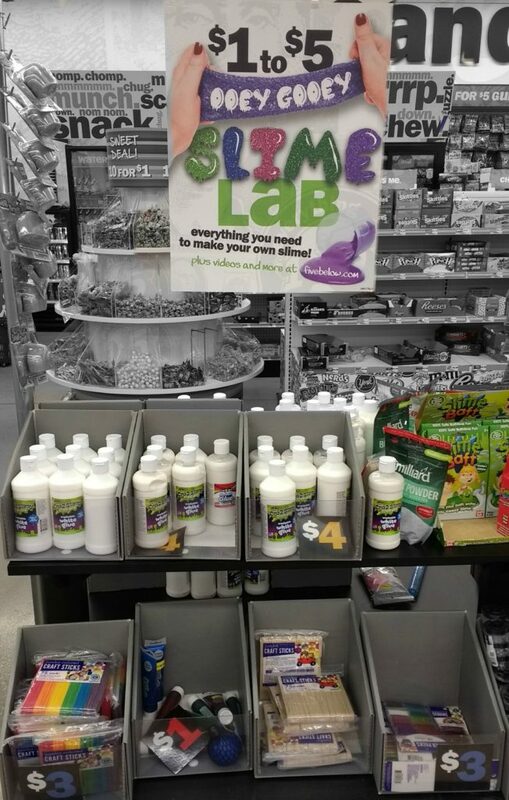 I was in my local Five Below this weekend and noticed they had an entire ‘Slime Lab' section with all of the supplies you need to make slime. Pretty cool. The best part is that since the weather is nice, you can keep the mess outside. Here are some AWESOME ideas and recipes for slime. There are even instructions on how to fix it if you make it wrong. There are tons of cities and towns nationwide that do a Movie in the Park. My kids LOVE going to these. Usually, they are completely free and we have such a good time. If your city doesn't offer one, maybe a neighboring city does. Pop some popcorn, grab some bug spray, a blanket, and a couple lawn chairs and you're good to go! Most people know someone that owns a projector. Hang a sheet in your backyard, hook up a laptop, some computer speakers and have your own neighborhood movie night. If you're extroverted, it would be a great way to connect with some other families on your block. If not, just make it a family thing. What about topping off the night with a campout in the back yard? This is really cool! You can use normal household items to make this frozen ice chalk! 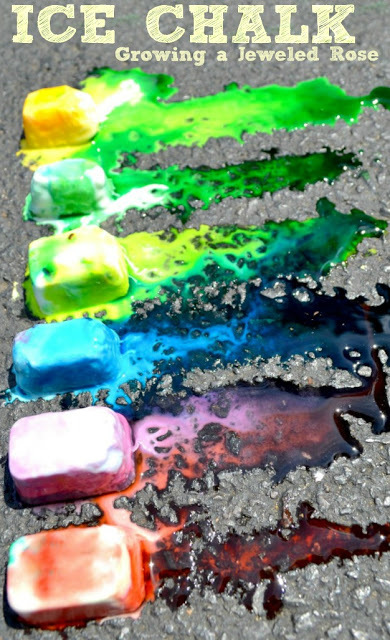 Baking soda, corn starch, coloring, water and you got it! This would be a great activity to do a few times over the summer with the little ones. Grab a clip board, paper, and a pencil. Take your kids on a short bike ride or walk, or even just around the block. Help them make a map of the area as you go, or from memory. Have them count how many houses you go by and what color they are, the street names you walk across, and any landmarks. Once you have your map sketched out, they can color in the houses, and add cars or other landmarks they noticed on the way. My kids LOVE salsa and they also love zucchini bread. Making a salsa garden or growing zucchini is something that your kids might really enjoy doing. You don't need much space to make a garden like this, but if you don't have the yard space, you can try growing things in pots. This is a great summer-long activity to do and they'll enjoy eating what they helped grow as well. 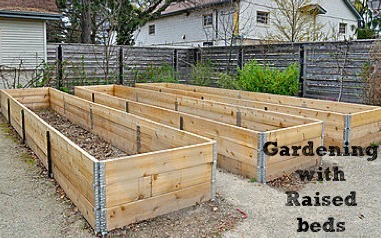 You could also try a Raised bed Garden. Go on a walk with the goal of collecting things to make a magical fairy house. Gather small sticks, larger pieces of bark, moss, small pebbles or other items. Once you head home you kids can assemble them into a small house for fairies. They can put it in the garden, or in a flower pot. Add some glitter at the end as ‘fairy dust'. You could also head to the dollar store and buy a small bird house to use as the main structure. They can paint it and then glue bark, moss, sticks, and rocks to it as they want. 12. Take your board games outside. This one is super simple, but sometimes just changing the setting of normal activities makes them new again. If it's not too windy outside, take your favorite board games outside and play them on the deck or sidewalk, or wherever. You could even set up a card table outside and play them there. It will keep the kids occupied and you can work on your tan! Find all of the public parks in your city and visit a new one each day, or a few a week. Then, you can ask your kids what their favorite parks were and why. You might have a free museum in your city. Check it out. If your kids leave you feeling too outnumbered (I have 4, I can sympathize) why not try the aquarium, a children's museum, or science center. Have your kids pick out their favorite type of flower from the pictures on the seed packets. Help them follow the instructions on where and how to plant them. They can check on how much it grows each day and measure the growth, record the temperature outside and how much water or sun it got. Plant specific flowers and plants that butterflies like to attract them. Who doesn't love butterflies?! In fact, the National Wildlife Federation gives away free Butterfly garden starter kits at different times. But if they aren't offering them, just do some research on what flowers and plants butterflies like and plant some. Set a summer goal to learn a new skill like juggling, hula hooping, pogo sticking, or something else creative. What would make it really fun (and funny) is if you took the challenge yourself and learned along with the kids. Get involved in a local summer reading program, specifically at your local public library. Most public libraries have a summer reading program you can take advantage of. This is something you can get all of your kids involved with, or just go to the library and read to the little one(s) while the older ones participate. Draw a target on the driveway with chalk with different point values. Throw wet sponges or sponge balls at the target and keep score on the driveway with chalk as well. It might just turn into a water fight, but that would also be a win! Have the kids think about some way they want to serve in the community – picking up trash, visiting a nursing home, making crafts for someone, doing yard work for an elderly neighbor, etc. See if you can set a goal to give back to your community at least once or twice over the course of the Summer. If they come up with the idea, they are more likely to be motivated in the act. After you do, have a ‘debrief' time with them. Ask them what the liked about helping like that, how it made them feel, and if they have any other ideas to try again. If you have friends with kids the same age as yours, see if they'll do a toy swap for a week or two, (or forever). Just changing up your kids' toys could keep them occupied for hours. Play dates are always fun, especially when you can chat with other mom friends while the kids play. Actually put some on the calendar, though. Once a week, Tuesdays and Thursdays, whatever. I've found that if I have stuff on the calendar, it's easier to make happen, and if I schedule out far enough, there's nothing that will conflict with it. TheHomeschoolScientist.com has some awesome home science experiments you can do with kids. This one on how to extract the DNA from Strawberries is really neat! Here's another page that has 100 Science experiments to try over the summer! Might be a great resource! You're not a bad mom if you let your kids watch a movie or two every once in a while. Getting out in the sunshine is important, but if you have to get some work done and your kids need supervision. Do what you gotta do to get your chores done. That doesn't mean you a bad parent. Sometimes I don't like to see my kids take their toys outside because they'll ruin them. Just let them! The worst that happens is you have to throw them away, and then you'll have less stuff to trip on in the living room. Sounds like a win to me! They'll probably have so much fun! We have a couple free nature centers in my area and we have such a great time every time we go. Pack some sandwiches and enjoy some nature walks. Get them good and tired out, and maybe everyone (including you) can get a nap in, or at least an early bed time. State parks many times are free or really cheap as well! Get out there and see what's in your community! Talking to the elderly is something I really enjoy. If you think about how much has changed, just in the area of technology over the past 50 or 60 years, it's astounding. Our grandparents truly grew up in a different world. Have you and your kids ask an older adult, a grandparent, someone at a nursing home, or an elderly neighbor your friends with about what they did when they were little. They will probably launch into some super interesting stories, and would probably really enjoy the company. You can even help your kids come up with interview questions ahead of time if you wanted. Or just wing it. The best part is that you might get some new ideas for stuff to do from the interview. Next, have the kids draw pictures of any stories that person tells about their life as a kid. You can then give those pictures to the elderly person as a thank you gift. Even though Lowes canceled their Build-and-Grow kids' workshop Saturdays, Home Depot is still offering theirs. You can have your kids build a small wood project for free on select Saturday mornings. They are super fun! Visit your local Home Depot or you can check their workshop schedule here. Groupon has a specific area for children's activities Groupons. See if something offered in your area fits your budget. Even if you end up not wanting to buy any, it might spark some ideas for free things to do you never thought of. I've found that most of the time when my kids say, “I'm bored,” or, “There's NOTHING to do,” it typically just means that they want to do something with me. I might not have time to play with my kids all the time, but when I can, it really helps them and me. I always have fun and am glad I did. It's usually about doing something with you that makes all the difference. If I told my kids to play a board game, they more than likely would not, but if I played with them, they would almost certainly play, because I was playing with them. Make time for it. Because we all know that it won't always be like that! Thank you! Not only good for summer, but I am going to use these for homeschool ideas too!